I love Paper thin crispy rava dosas. This dosa does not need any fermentation and could be prepared quickly. I took the proportion from lathas blog and its pretty accurate. Mix all ingredients together ( except onions). Let it rest for 1 hour minimum (Rava tends to absorb the water). The batter will be a very thin pouring consistency, like butter milk. Mix the batter well and start pouring the batter (using a laddle or a small cup) from outside of tava to inside forming a circle, wait until bottom is nicely brown. This will take some time. Top will be automatically cooked, if required you can flip and cook the other side for few seconds. Use oil if its not a non-stick pan. Wipe the tava with tissue, sprinkle onions on tava and proceed with next dosa. Maintain high heat for better results. Give the batter a nice mix before making each dosa. 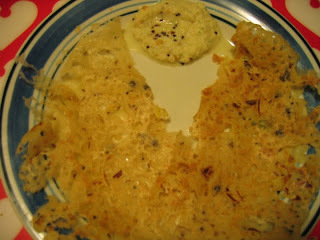 I saw an alternative method of making this dosa here and I had followed this method and the results were really good. 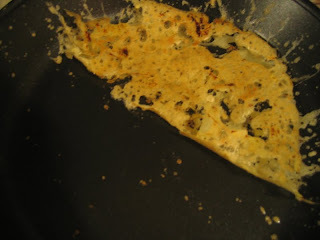 Give the batter a good mix , try to take handful of batter WITH YOUR HAND and sprinkle on the hot tava. Repeat this 3-4 times trying to fill in the tava here and there with the batter and until u see a decent round shape on the tava. Let the bottom brown, flip and serve. This method was really successful for me (Infact I did not use a bit of oil in my nonstick pan except for my first dosa) and the dosa came off pretty well maintaining its shape with much ease. Looks good. Thanks for the video link. I always used to have hard time pouring it. can u believe i have no rice in my house...absolutely none and no time to get some..but my i need to make some dosas...im so thankful i found this recipe....making it asap!!! I too love crispy thin dosas! Woww dosa looks too crispy and yummy.....its quite tricky na, great work.. Awesome dosa and a truly beautiful click. I too make this at home, easy and quick. Dosa looks crispy and yum ! Rava dosa looks like a restaurant paper roast :D Very nice post, cool clicks and a yummy breakfast. I tried the recipe, but for me the dosas didn't come crispy They were more soggy and soft. I fried it till the bottom got all crispy, but the top was still soft. Is there a trick or some tip that I have to follow ? Overall the dosas were fine, but not as I expected. Hot n crispy rawa dosa tastes divine. First time here. Amazed by the wonderful space you have. Will be visiting here often. Do drop in at my blog sometime. Well its a dellllaaaaayeeeeed reply but I was not on this page until now. My apologies. There is no other trick than in the recipe. 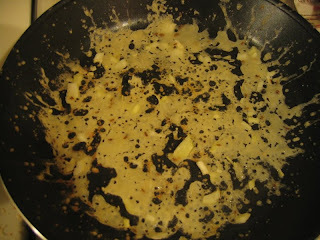 You might want to keep ur griddle very hot, before u pour in the dosa batter. Also the consistency should be as of thin buttermilk. Do try. Good luck! hay great pictures with nice explanation......superb method. Dosa looks crispy and yummy.